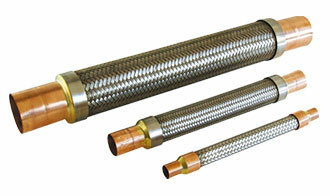 Anaconda is a leading distributors of industrial metal hose, heat exchangers and vibration eliminators. Our experience spans over 40 years and allows us to offer the industries best products at competitive prices. Anaconda Universal Associates, LLC offers over 40 years of domestic and international experience in flexible metal hose, engineering/marketing as well as the electrical industries. Many of the products are listed by various approval agencies including Underwriters Laboratories, Inc. or certified to the International Standards ISO-9002 and the Automotive Standards QS-9000. The products are specified and supplied as original equipment, installed as components in original installations or covered by federal stock numbers.